Charles Enriquez, BA ’98, asks the room of 48 high school students what they had heard about the McCombs School of Business before they arrived at camp. “It’s one of the best business schools,” one student says. “It is the best,” another adds. “I like that answer,” Enriquez replies, launching into a Q&A session about admissions at McCombs. 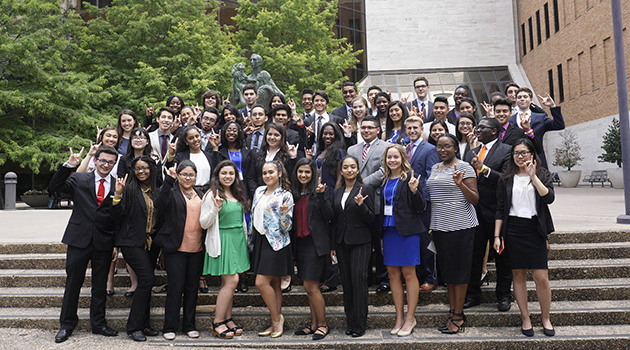 Coming from all over Texas, and as far as California, students entering their junior and senior years spent a week at McCombs’ Discover Yourself in Accounting Majors and Careers (DYNAMC) camp in June. The camp is about more than just accounting classes, though; it’s about the entire college experience. And for McCombs, it’s a recruiting tool. Part of an effort that originated with the National Association of Black Accountants, DYNAMC is open to all students, but focuses on reaching underrepresented students. The application process for the camp is similar to applying to college: Students have to turn in a letter of recommendation, résumé, transcript, and essay. Once they’re at camp, they experience living in dorms, going to class, and the fun side of college, with tours of Darrel K Royal-Texas Memorial Stadium, dinner at Pluckers, and laser tag games. In addition to participating in McCombs classics like an etiquette luncheon, the students at DYNAMC worked in teams to present their decisions on two hypothetical accounting cases. The first case required the students to analyze and compare companies to invest $200,000 into. The second case involved a plant that had a recall and the students had to find ways to cut costs. The teams presented their cases to representatives from accounting firm EY at the end of the week. EY sponsors the DYNAMC program, making it free for students. Enriquez says they are one of many accounting firms trying to increase diversity within accounting and business fields. Tina Taylor, senior project manager at EY, was impressed. “To be able to do what they did in a week is amazing,” she says.